The New York-based Human Rights Watch (HRW), a global NGO of research and advocacy on human rights, today has published an open letter to Iran’s President-elect Hassan Rouhani. HRW calls on Rouhani to prioritize human rights during his presidency. In the letter, HRW expresses serious concerns regarding Iranian human rights, including the issues of political prisoners, executions, freedom of press, academic freedom, the rights of women and minorities and restrictions on civil society. To read HRW’s letter, please click here. -OH!! H.R.W! [Human rights watch]@-where have you been all along when ?when non-combatants kids and women were killed mercilessly in the wars of IRAQ,AFGHANISTAN,and LIBYA done in the name of uprooting a regime?. -WHAT is your take then when a member Nation in the UN security council openly stokes the embers of a war by pouring in high tech arms and funds to a group of fighters[instead of calling for fair polls] on the receiving end against a popular ruler loved by His people and his military . -OH H.R.W!,are you concerned also on the plight of widows or widowers and orphans ,their number increasing by the day as their location is under siege from ferocious high tech drones doing their lethal thing on them very inhumanly and denying its victims any chance to defend themselves in a COURT of LAW!. -WOULD you then dare write a letter to the CIA and rise your concerns on these issues and more if possible explain to the world why the CIA makes justice look a MOCKERY! How about writing a letter to Obama and the US stasi police state to shut down Gitmo and global gulags, stop NSA/CIA snooping and murdering thousands of women and children by drones? 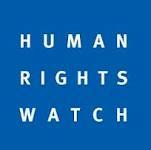 HRW's letter, if you have actually read it, is very specific on charges of human rights abuse in Iran. It would be very helpful if you respond to those points specifically, instead of attacking HRW as an organization or trying to change the subject by sloganeering against the U.S. If you want to defend the human rights record of the Iranian government, please do so. As starter, please answer HRW's charges. Thanks. I bet you two are living very comfortably in the West.What a bunch of hypocrites. How about we focus on the economy first and foremost? I know human rights is not a comfortable topics. But unfortunately is a major factor for political development in the country and hope Rouhani would not think like you, otherwise bringing economy back to normalcy might take few years. Should he wait for the economic turnaround to address these questions, as uncomfortable as they might be for him? Probably not, people who voted for him understand the urgency of economic issues, but also took his words on rule of law very seriously.